Hell on Earth. Overwhelming odds. Mountains of razor-sharp coral. And a nearly invisible enemy bunkered inside impenetrable, hidden caves and tunnels. 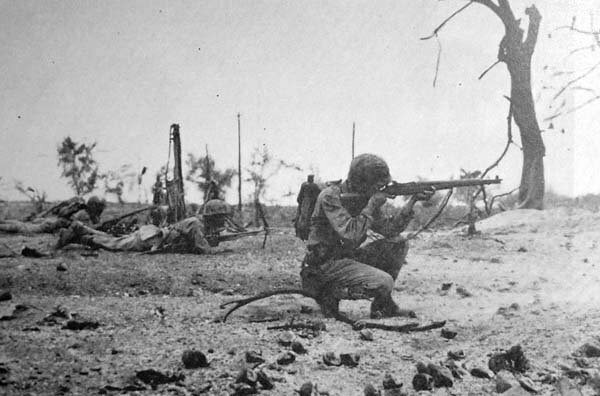 That was the battle of Peleliu, where Marines landed 73 years ago this month. With a higher death toll than any other amphibious assault in U.S. history, the Battle of Peleliu shows that Marines never give up. Success on this battleground was measured in yards and bodies. 1. The most decorated Marine in history. Despite an infection in his leg from shrapnel, Col. Chesty Puller, commander of the 1st Marine Regiment, led from the front, giving life to the motto, "Lead like a Marine." Blood and guts are how he earned his reputation as the Marine's Marine, standing shoulder-to-shoulder with his men against a ferocious enemy. Puller favored junior enlisted men who did the majority of the sacrificing and dying, and utter contempt for all staff pogues of whatever rank. During his four wars, he was the only Marine to win the Navy Cross five times for extraordinary heroism in combat. His unit lost more than half its Marines on the first day of the fight. It was a miracle he survived. 2. Wounded by bayonet, but he didn't give in. Sgt. Patrick A. McGinn served with A Company, 1st Pioneers, 3rd Battalion, 1st Marines, as well as K Company, 2nd Battalion, 7th Marines. As a demolitions expert, his job was to take Bangalore torpedoes and satchel charges to blow up caves where Japanese troops had hunkered down -- a place known as "Bloody Nose Ridge." During fierce rifle fighting and hand-to-hand combat, he was seriously wounded by a Japanese bayonet. Later, McGinn went on to fight Kamikaze attacks in Okinawa despite complications from his previous wounds. He never gave up. In addition to three Purple Heart medals, he received the Navy Cross for numerous acts of uncommon valor. 3. He gave his life to defend others. 1st Lieutenant John Gravitt -- 7th Marines, 1st Marine Division -- commanded a rifle unit, which suffered a vicious attack from two Japanese units that had flanked and threatened to overtake them. Gravitt grabbed a machine gun and went into the open space between his men and the Japanese. He ordered his men to get out and covered their escape. His men recounted that after he expended his ammunition, he engaged in hand-to-hand combat before succumbing to a shot in the head. For saving all of the men in the unit that day at the expense of his own life, he received the Navy Cross for "extreme valor." 4. He neutralized a Japanese machine-gunner -- alone. Pfc. Stanley Parks served with L Company, 3rd Battalion, 5th Marine Regiment, 1st Marine Division. Up against a fortified cave and in the face of superior firepower, Parks singlehandedly took out a Japanese machine-gunner, as well as all of the enemy soldiers in the cave. "They had a Nambu machine gun -- the fastest-firing weapon the Japanese had -- in front of the cave. I got the machine-gunner with the flamethrower. He was one guy who wasn't going to go back and tell any stories," Parks said. As one Japanese soldier tried to escape, Parks let loose and "made sure he was dead." By taking out this strategic position, Parks saved the lives of many Marines that day, and was given the Navy Cross for his acts of valor. 5. No time for being scared. Lcpl Manuel "Berk" Berkowitz served with 3rd Battalion, 1st Marine Division, and went ashore under enemy fire with the third wave. Berkowitz later said he simply didn't have time to be scared. "The Marine Corps taught us, if you were scared, you never showed it, plus we didn't have the time," he said. He received the Distinguished Service Cross and numerous other awards for acts of valor, in part for going out under heavy enemy fire and saving a fellow Marine who was trapped on barbed wire.